Junior Basketball tournament is a tournament designed in preparation for Junior qualify tournament at the end of the month. Referees and bench duty is very important development of this tournament besides the actual games. Students are required to understand the rules of bench and new referees learning what they are in for at the qualifying tournament. Junior Basketball has increased this year to 30 teams 2018. Last year we only had 20 teams, basketball is a growing sport in girls and boys in the bay of plenty . Action packed day with all courts jammed packed with exciting junior talent. 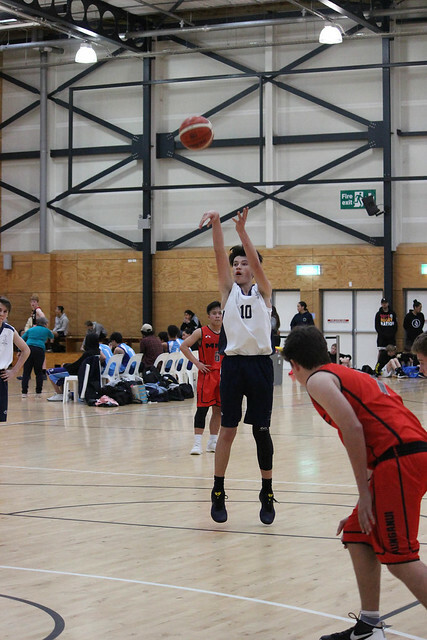 The boys premier grade (top boys grade) was won by Tauranga Boys College who displayed fantastic Ariel athleticism and fitness and team work on defence, which was splendid to watch. The girls premier grade was won by the Mount college 1st time ever, since the tournament has been running. Rotorua Girls coming a close 2nd and have defended this title for years ,the girls premier grade was exciting to watch with some very quick guards and tall players which put in a lot of two footers and offence rebounds. Overall, the other grades A B C grades for the boys and A B grades for the girls had some exciting buzzer beaters and overtime the basketball on display was very close games throughout the grades. Over all, what I witness at the event the quote from Larry Bird “Push yourself again and again. Don’t give an inch until the final buzzer sounds” that was the case for a lot of the grades on Friday. Thank you to Tony Webster (TCBA) for picking all the MVPs and as the presenter for prize giving and to Cliff Horne and referee development you had a big task all day and finally to Melissa from Sport Bay of Plenty without you guys this event would not have been possible.